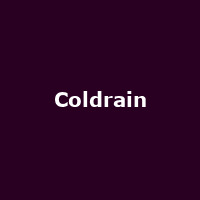 Coldrain are a Japanese metalcore band from Nagoya, formed in 2007. The band are fronted by singer Masato David Hayakawa, plus Yokochi - guitar, Kazuya Sugiyama - rhythm guitar/ backing vocals, Ryo Shimizu - bass/ backing vocals and Katsuma Minatani - drums. They released their debut album, "Final Destination" in 2009, followed by "The Enemy Inside" (2011), "The Revelation" (2013) and 2015's: "Vena".